According to the Star-Telegram, Forest Service Survey indicates significant tree loss. Tree removal expert cutting down a tree. "When trees are precariously tipping over... they can present a real danger." Ask any farmer how they feel when they hear the word “drought” and the reactions are bound to be negative. The dry weather impacts their crops, which impacts their livelihood. But according to the Star-Telegram, a Texas A&M Forest Service survey of “about 600 hundred forested plots” across the rural area of Texas indicates that a staggering 301 million trees were taken down in 2011 from the deadly trifecta of drought, savage winds and brutal, record-breaking high temperatures. For Texas forests, it was considered one of most substantial losses in the past century. The 301 million figure fails to include trees that died in urban and suburban parts of Texas. The urban losses are reportedly even higher. The survey incorporated both “ground-level assessments made during a three-month period this year” as well as satellite pictures before-and-after the drought. The loss of trees is making their presence felt in the lives of commercial timber workers, as the drought has resulted in $669 million in losses. This figure is comparable to the losses suffered from Hurricane Rita in 2005, whose winds took down scads of trees. On the other hand, tree clearing professionals are actually up to their necks in work, with all the fallen trees abounding. Mauricio Fallas of Amazing Tree Services wants to shed light on another facet of this problem. He warns, “when trees are precariously tipping over, or already knocked down, they can present a real danger to both property owners and pedestrians alike”. If a tree falls on your home, it will not only damage your home but can also injure any family members who happen to be inside at the time. If a tree falls onto a utility line it can also cause power outages, fires and other damage. In terms of law suits, if a tree on your property falls on a neighbor's property or on an unsuspecting pedestrian, it can incur physical and monetary damages, not to mention a potential law suit. If a tree has fallen on a homeowner's block or in front of their property, Fallas recommends calling a professional for safe tree clearing. Tree removal requires heavy, complicated machinery and the experience of trained experts, so it is not something to be taken lightly or attempted on one's own. 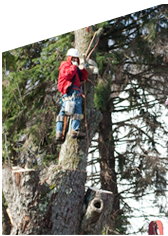 If an attempt is made to remove the tree without professional help, back muscles can be pulled, other injuries can occur, and the machinery can be damaged. Fallas warns that removing a tree without outside assistance can be a bigger risk than one initially expects.